Even in the age of GPS and the decline of print media, the paper map not only still has a place in the market but is also seeing marked improvements. One good example of this is Canadian Cartographics Corporation (CCC) who excitedly released a 2013 provincial road atlas of Alberta under their “CCCmaps.com” imprint. This new road atlas boasts more detail and coverage of Alberta than any previous map publication and is the first of its kind to feature the entire province in one large, GPS compatible scale. Details such as the oil sands or the Athabasca River have never been easier to read. 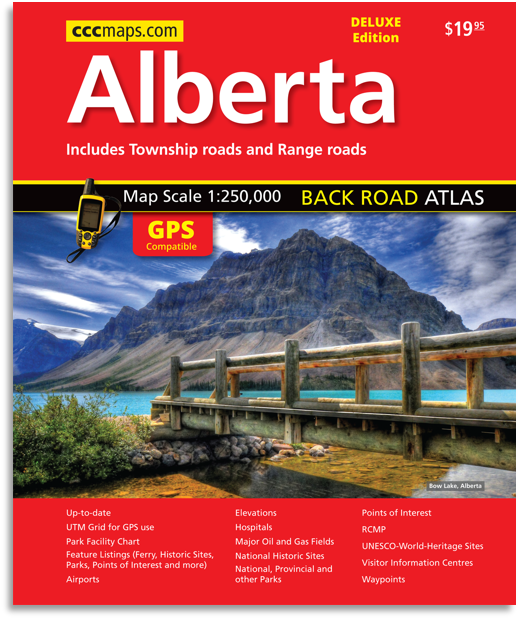 The CCCmaps 2013 Alberta Road Atlas is now available at major retail outlets throughout Alberta, look for the red cover. For more information visit their website www.cccmaps.com. ABOUT CANADIAN CARTOGRAPHICS CORPORATION (CCC): 100% Canadian owned and operated, CCC is Canada’s largest and oldest distributor of Maps, Atlases and Guides. Headquartered in Oshawa ON, CCC boasts the largest distribution network in the country with mobile warehouses in every province able to service Canada’s finest retailers in real time. Each distributor for CCC is a small family business.